I don't know Josh Ripley, but I love that kid! Let me tell you why. Sixteen-year-old Josh is a junior at Andover (Minnesota) High School. He was running a 5K race on Sept. 16 in a field of 261 competitors. With the race less than half done, the 6-foot-5-inch runner heard a scream and saw a runner he didn't know crumpled against a fence — holding a profusely bleeding ankle. The injured athlete was 5-foot-5-inch Mark Paulauskas, a freshman at Lakeville South High. Here is Mark's account: "He just picked me up without saying anything and started carrying me and trying to calm me down. He said, 'It's going to be OK. I'm going to get you to your coaches.' ... I think it's amazing." Sure enough, with his own coach trying to figure out why Josh hadn't passed the halfway mark, he spotted him. "I was wondering what was going on, why was he so far back," said Scott Clark. "Then I see Josh. He's got the kid in his arms." Josh Ripley carried Mark about a quarter mile! 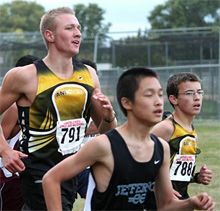 He handed him off to his coaches and family and then — dead last in the field of runners now — sped off to resume his race. He passed 50 kids to finish 211th out of 261 runners. No excuses. No disappointment. No explanation. He just finished what he had started — only to be asked by one teammate why he had fallen so far behind. "He just humbly says, 'Oh, I picked up a kid,' " said sophomore Simeon Toronto. "And I'm like, 'Dude, you just picked up a kid and carried him?' That's incredible!" Then added Toronto: "It was just so typical Josh." I love that kid! And while most of the news reports I tracked down cited this as a supreme example of sportsmanship and compassion among athletes, I think they missed the real force at work in Josh's action. The details make it pretty clear that it was the unfolding of a very practical faith that Josh embraces. He does volunteer work at Living Word Christian Center and — by both Mark and Josh's account — prayed over Mark as he ran with him in his arms. He prayed for Mark's pain to stop and for him to be all right. He even asked Mark's permission before he started the prayer! And Josh seemed honestly bemused by all the attention being paid to him later. He insists he did "nothing special" — but said he was just thankful God let him be there for someone who needed help. Mark's ankle needed 20 stitches to close the gash some runner's spikes accidentally created. Blessedly, there were no damaged ligaments or tendons. He should recover fully, after he gets out of a walking boot and off his crutches. Josh has reminded me again that there are wonderful people out there who are always doing kind and good things with no expectation of being noticed or rewarded. Great kids who aren't threatening teachers or doing drugs. People whose faith is not a banner or excuse, but a daily lived reality. I just love that kid! Don't you? And I want to be more like him. "I Love that Kid!" by Rubel Shelly is licensed under a Creative Commons License. Heartlight encourages you to share this material with others in church bulletins, personal emails, and other non-commercial uses. Please see our Usage Guidelines for more information.